There are many reasons to 'cross over to the other side.' We may feel the need to run away from something or we may have the desire to run toward something -- or both. And it could be that we really need to cross over to be in God’s will; the “secret” is doing it In God’s Time. Our emotions are fickle, so we can’t rely on them alone to give us God’s timing. What seemed so urgent to push us to cross over yesterday could bring us pain and frustration today. What appears to be calling us from the “other side” today might possibly cause our downfall tomorrow. That is why it is so important to cross over with God. His timing is perfect as we can see from some of the incidents recorded in His Word. Someone has said God will not send us where His Grace will not keep us. He will not leave us on our own when we cross over in His time. When Moses led the Israelites to the edge of the Red Sea, their situation looked fatal. The well-equipped Egyptians experienced in warfare were advancing toward them from behind, the sea was before them and mountains boxed them in. The only equipment they had was Moses’ rod, and their only experience was slavery. It looked absolutely hopeless, and that was just the opportunity God needed to bring a safe “cross-over” to defeat their enemies and show He was God. It became a landmark of history. God could have already rolled back the sea and His people could have trotted across whistling and happy to be on their way, but He wanted them to look to Him with faith and full assurance in the future when they faced crises that lay ahead. He allowed them to first see a great need and emergency which they could do nothing about and then watch Him take care of it with power and precision—in His time. Moses told them, “Fear ye not, stand still, and see the salvation of the Lord…” (Exodus 14:13). With perfect timing, they crossed over to the other side and their enemies perished in the same sea that had opened up a roadway for their escape. Imagine this: Winds strong enough to roll back the sea and hold it as a wall and powerful enough to dry up the mud of the seabed, yet gentle enough to allow one to three million people to cross over to the other side safely and unharmed. “What a Mighty God We Serve!” And how exciting it is to watch Him at work for us. When Joshua came into command of the Israelites after Moses’ death, he faced a similar need to cross over at the Jordan River. “…he and all the children of Israel, and lodged there before they passed over” (Joshua 3:1). Before they “passed over” God wanted them to know that He was in control. He could have brought them to Jordan earlier or later. The river was in flood stage at this time and would be an even greater challenge to cross. He even had them remain camped there for three days (observing and considering their circumstances) before giving them marching orders. As they camped by the river, Joshua “…said unto the people, Sanctify yourselves; for tomorrow the Lord will do wonders among you” (Joshua 3:5). These were not the same people who crossed the Red Sea. All of those had died in the wilderness except Joshua and Caleb; so this would be a new experience for this generation. Each generation needs its own “crossing-over” experience to learn they can trust God. As soon as the feet of the priests bearing the ark touched the river, the waters rolled back (“stood upon an heap” v 13) and opened a way for them to cross over on dry land. Another evidence of God’s perfect-timing-for-the-good in this crossing over was to provide for them on the other side. The manna stopped because they had reached the other side just at harvest time! He prepared a “table before them in the presence of their enemies.” Their needs were met—just on time! This was a momentous historical crossing. God was leading them into the full potential of the land He had promised Abraham that his future generations would come into. It was fully prepared for them, with crops already planted ready for harvest, cities already established and the promise to defeat all of their enemies on the ‘other side.' All He asked of them was their cooperation and their complete loyalty and trust in Him. The cross-over was a declaration of war and notice to their enemies that they were there to claim what God had promised them. They had to cross Jordan first, then march toward the enemy with God in command. Satan has claimed much of God’s territory in the lives of many Christians—and churches—today. It is time to “cross over” and reclaim what Satan has stolen. When God’s army follows Him, they can march boldly into the camp of the enemy and take what is rightfully theirs. We can put total trust in God’s Word. 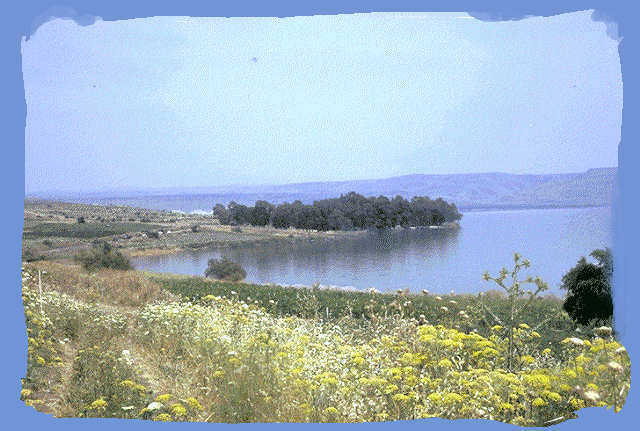 Jesus said to His disciples, “…Let us go over unto the other side of the lake” (Luke 8:22). They embarked on the lake journey, and Jesus fell asleep; He knew He was going to the other side. As they sailed across the lake, a storm arose bringing terror to the hearts of those seasoned sailors. They failed to hear Him say, “Let us go over” and feared instead they were about to “go under.” He told them they should have had faith in His words to “go over.” He spoke to the storm, bringing a calm; and they crossed over to the other side. Many times God leads us by a new way as He did Joshua and Israel: “…for ye have not passed this way heretofore.” Though the new way and “other side” may be unknown to us and filled with enemies, even giants, God doesn’t want us to be intimated by seas or floods or storms or enemy giants. He wants to be our Leader, Provider and Comforter in times of change and crossings, and He is always on time! If we take matters into our own hands, cross over in our time instead of His, we may very well miss the greatest demonstration of God’s move in our lives. When we operate on His time schedule and follow His orders, we will make the “crossing over to the other side” in safety and blessings. This will not only bring blessings to us, it will bring glory to God and increase our faith in His faithfulness.